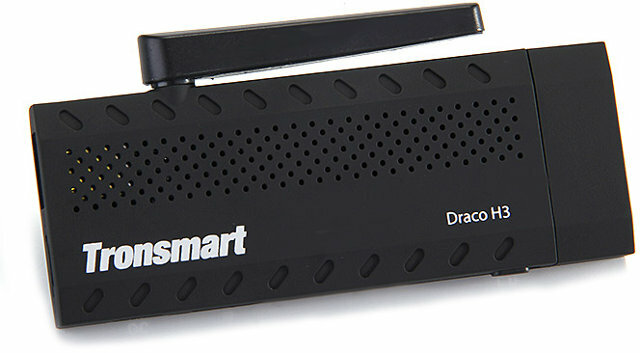 Tronsmart Draco H3 is a low cost HDMI TV stick powered by Allwinner H3 quad core processor. At $35, the device costs about $5 more than Amlogic S805 based sticks like MK808B Plus with about the same specs (quad core Cortex A7/A5, 1GB RAM, 8GB flash, HDMI out..), but with the added benefit of 4K @ 30Hz support. Tronsmart has now released some firmware files as well as Linux kernel and an Android SDK. Please note that the resolution will only affect the user interface, and when you play videos you should get the resolution selected in Android settings. So if you play a 4K videos it will truly show as a 4K video on your TV, even though the user interface is only 720p, at least that was my experience when I tested 4K videos on various Android TV boxes. Since Draco H3 normally updates its firmware over the air (OTA), the firmware files should only be useful in case sometimes goes wrong, or if you want to change the user interface resolution. You need PhoenixSuit (Windows) to flash the firmware. I’m not sure whether LiveSuit (Linux) supports Allwinner H3 yet. If you want to experiment with the source code you can go ahead, but bear in mind that in the past Tronsmart SDK releases were several months old and lacking the latest bug fixes. So it will probably build and run on the device, but this is unlikely to match the latest firmware, unless they changed their ways. The Linux source code for Allwinner H3 has also been released for Orange Pi 2, and since the board runs Linux, you might also be able to adapt the Lubuntu, Raspbian or Debian image to run on Draco H3, although I assume 3D acceleration and video hardware decoding won’t work in Linux desktop distributions. I think when you play Higher res. videos (1080p or 4K) on 720p firmware you’ll end up getting no more than 720p res. it’s simple logic right ? Normally not, because videos are rendered on a different hardware buffer, and both that hardware buffer and the frame buffer are then scaled to whatever HDMI output resolution is set. I’ve explained in more rails in some of my “4K” posts. The part about Sigma Designs in that post explains how it works. Thank you very much for the info. , Never heard of this before. With libhybris those should get full 3d? Did you test the 3D/4K on this box ? i couldnt find any review from you on this stick ? I have not reviewed it yet. I can’t review anything until end of July, as I’m not at home. Firmware doesn’t build, not everything is there in the downloads. The entire ‘build’ subdirectory tree is missing. Do you mean lichee or android? The Android file is missing the entire ‘build’ subdirectory tree. We will contact tronsmart to check again. thanks for the suggestion. Eventually downloaded it, yes build is missing. But at least they have ‘raw’ patches from Allwinner. BTW, lichee have compilation also, but I didn’t check what’s wrong with it, may be just small typo in kernel sources. I’m getting tired of constant problems with building Allwinner’s code. This board was going to be an H3 but now I am looking at the RK3128. The code at Firefly built on my first try. Plus they answer their forum. Android 5.1 too. Looking at FirePrime. Anyone know what the RK3128 costs? I see H3 chips for sale, but no listings for RK3128. every allwinner device i have i have has a problem with apps connecting to google play services or some gmail. some video app i got like dizitab or dizitvhd you have loginto them so you can add you favorite’s and so on but on my draco h3 and draco a80 these apps do not sign in. all my other devices i have no problem. Hi, we have found the problem., it’s our staff who uploading the SDK ,miss the file, and we will upload the sdk again. Why don’t have the AP6212 driver for the wireless? To rebuild the linux .img it is necessary to have the driver for the WiFi chip AP6212. The SDK is useless without it. Somebody at Tronsmart can deliver to us this driver? source code would be better. i just get from factory. i am not the linux guy, so i don’t know how to use it, you guys can check. but i will try to get the newest sdk for draco h3, and ask them to put this driver in the new sdk. So it looks like it’s possible to run Linux on other Allwinner H3 devices such as Beelink X2 for $30 or so? Hello i have just bought the Draco H3 device it started well but after it said to make an update and froze there for a lot of time so i unplugged it and now it wont work . it says no signal on the TV and on the PC with the Phoenix Suit it says no device attached. what to do? Hello! I have the same problem! What can we do? Wow nice thread, trying to find an alternate image to flash on my H3. Its a great little device but I don’t trust original firmware, and building from source seems really problematic, would be nice to see a clean port working off the box for this device, its cheap and powerful. I’m not sure you’ll find an alternative firmware for the device, maybe try on Freaktab forums. Allwinner H3 processor is now mostly popular with Linux, especially on development boards.